« Oops, RC Messed Up. It’s hard to put a sea ice post up against the entertainment RC is providing RC Messed Up. I’m just an engineer though and still learning the business of blogging. It takes days of work (for this computer) to make these videos so hopefully the effort is worthwhile. In these video’s the centroid is plotted of the Arctic sea ice. The centroid (center of mass) is the point on which an object will balance. It turns out that the calculation of centroids can be expanded quite easily to shapes even as complex as sea ice. It is computed by summing the sea ice concentration m times its distance from a point X and dividing by the sum of the sea ice concentration m. The result in this case is a ‘concentration’ weighted value representing the center of mass (concentration) of the ice sheet. Applied in the X and Y directions we get a point representing the center of the sea ice in the Arctic. The red line is hooking upward relative to the other curves, something I predicted a whole two days ago. Actually, my original opinion was that the line would continue to follow the orange 08 line until I saw the difference in the weather patterns from the following videos. Today, perhaps as unlikely as it seems, my guess is that we’ll finish above the 06 black or even the 03 blue, perhaps you will agree with me after seeing the following videos. There is time in the next month for the weather pattern to change again though so I reserve the right to revise and extend my remarks 😉 . This post is broken into two video’s. The first one is 20MB on You Tube and is from 2005 till the 27th. It runs at 15 frames per second and has good resolution so you can see the clouds of 2007 summer clearly and your eyes have just enough time to catch the small shifts in centroid from sea ice movement. In these videos, the green cross is the centroid of the sea ice on the day displayed. The large green circle is the limit of the data used to calculate the centroid as I wasn’t interested in more distant effects. The light blue dot in the center is the satellite missing data and the tail of the arrow represents the average centroid of July 27th for 31 years of data. Arrow length is calculated to be ten times the distance from the average centroid and the green cross representing the current centroid and is pointed in the direction determined by the intersection of both points. Don’t worry if this is confusing, the video clears it up. Think of it as the position of the center of ice mass relative to the summer typical center. Using an average centroid for the tail of the arrow was entirely arbitrary so fluctuations in the arrow direction are more important than the direction itself. The premise is that the center of ice mass will change according to weather patterns, i.e. wind blows from Arctic West and the ice melts there causing the arrow to point to Arctic East. These fluctuations seem more visible with additional vector data presented. Here’s the first video on You Tube, all videos use NSIDC data from the NasaTeam algorithm. YouTube VIDEO 2005 to present with centroid. Click to play. Here is a link to a downloadable version of the above video. It’s useful if you want to use a more controllable player such as the free VLC media player for viewing. There are too many details to list from this much data, however in the video the extreme nature of the clouds in summer 2007 and 2008 become apparent. Look at the weather patterns right before the big melt of 2007. Throughout the video, slight shifts due to winds cause noticeable movement of the green cross (centroid) amplified by the red arrow. This next video is from the full length version of the sea ice. I ran this one at 30 frames per second because it is so long. The purpose of this one is for the more interested folk to see how much weather patterns have varied in the Arctic over the last 30 years. Check out the direction of the centroid in summer 2001 compared to 2007. Here is a link to the downloadable version of this video. This file is about 70MB so it will take a little time. There are a large number of details in this file of course and I’m not an expert but one thing is clear, the air/water currents have a huge effect on the overall centroid of the ice. You’ll see currents blast from one side or the other pushing the sheet against different land masses creating more melting on the windward side while stacking (or clearing out) the ice against the leeward continent. I don’t think much more interpretation is required by me than that. Many of you have as much or more knowledge so I’ll let you guys and gals take it from here. P.S. It also looks reasonably clear that until the winds shift again, the northwest passage will likely be a northwaste of time. If the winds don’t pile the ice on one side of the Arctic or the other, there isn’t much chance of getting through IMO. This entry was posted on August 4, 2009 at 12:40 am	and is filed under Uncategorized. You can follow any responses to this entry through the RSS 2.0 feed. You can skip to the end and leave a response. Pinging is currently not allowed. Very cool Jeff. Thank you very much for your work. This is the best visual demonstration I have seen of the physical dynamics of the 07 minimum and how it differs from other minimums. Your suggestion to compare 07 and 08 minimums to ’01 really hits home. It seems so obvious that this was not merely about melting. I think Anthony will come knocking for this one. 1. Does your data include gridded thickness? I have to assume it must. 2. Does include gridded surface elevation? 3. Assuming that your clipping scheme cancels out effects due to changes at the extremities of the ice mass, how can you be sure the mass is moving? The centroid could move around in an orderly way without the mass moving horizonatally because of “orderly” thickness changes due to regional temperature effects either in the water or the atmosphere. 4. The centroid also has a Z axis and the mass a spheroidal shape. It looks like you ignored this. I can see that adding that dimension wouldn’t change what you’re doing and wouldn’t add anything either. Did you think about this? If you wanted to better show that the mass is moving horizontally, a pattern recognition routine that charted the locations of the pattern of the clipped gridded data might be a way to get at this. I hope these questions are not a waste of time. #1 I agree of course. The 07 year is pretty startling in its difference from any previous year. The cloud cover is heavier and the speed of them is visually higher. 08 had a similar pattern which to my eye seems to last for a shorter time. 1 – this post uses sea ice concentration data. The concentration data is the percent ice to water for each 25 x 25 km gridcell so if we assume thicker ice would tend to infill the area better than thin it kind of includes thickness. 2 – No elevation although it gives me an idea for looking at a plot of percent infill ratios. 3 – The motion of the ice sheet is actually a well known effect from (among other things) buoys, sat images and areal photos. You can verify it a couple of ways, first the patterns in the ice seem to be flowing they actually are. Here’s a couple of higher resoultion video’s of the sea ice in higher resolution from the AMSR-E sensor which is pretty clear. I’m sure some of the shift is due entirely to melting from the weather patterns. 4 – because the thickness information is limited, I didn’t do a z axis. As far as pattern recognition, you are way ahead of me. I’ve been holding that little trick in the background because 1 – its been done on the AMSR-E high resolution short term data 2- its a lot of work and I’m not sure if the lower resolution dataset will have enough detail to grab onto. Image processing is one of my odd specialties. If you had a choice of algorithm for following ice movement by pattern where runtime is non-critical, what algorithm would you choose? Thank you so much for answering my questions, Jeff. Being almost completely ignorant, as I am, may make it easier to ask questions. I guess the next one would be that if the thickness information is limited as you say, you must have assumed it to be constant. And my question, then, is: is it? I would readily accept that in the big picture, the variations in thickness get lost in the wash.
I’m reminded, once more, that it’s not easy to discuss post-graduate work in an area you didn’t even look at in high school – I’m talking about myself of course, retired architect. No problem, it’s better than working for a living. Sea ice thickness is accounted for partially through the concentration value as centroid is the concentration times distance divided by concentration. You can see the effect because after 07 much of the ice in the Arctic had been blasted away by the strong weather patterns from the southwest corner of the video and in 08 summer the colors throughout the sheet are darker than other years as melt season began. Darker colors representing less complete ice coverage. With that said, during winter months the ice sheet becomes basically continuous and thickness can no longer be determined with these instruments. Given that the landmasses constrain the ice growth the centroid will change in a regular annual pattern related to the growth of the ice as it bumps up against the land masses. Wouldn’t one have to factor this out to see what effect weather patterns were having? Am I missing something here? #7 It is one of the issues in interpreting the arrow. As always, I appreciate your work. Thank you. But I am a little “kung-fu-sed” (as my son’s karate instructor likes to say) about the graph of sea ice extent at the top of this post. The red line (2009) is shown to extend well into September. (Here in the unwashed hinterlands of the Midwest it is just the beginning of August.) Plus the maxima and minima are shown to be in March-April and September-October. So: Isn’t there an offset error on the x-axis? #9 The graph is right from Jaxa. The red line stops at the August mark, if you expand the graph you can see it a bit better as it kind of blends into the black line. As far as the minima, that’s the correct timeframe. Like the winter solstice is typically not the coldest day in the northern hemisphere but is at the point where we are cooling fastest. The hemisphere starts cooling before and continues well into January. In the case of Sea Ice, temperatures are cool enough to continue forming more ice for several months after the coldest point so there is additional lag. #11, do you know where there might be a cloud dataset. I thought that could be fun. Yes, thanks for the reply and the explanation. Initially I mistook the violet line (2002), which in the graph seems to end/disconnect in September, for being the red line, or maybe I have creeping colorblindness. Also, I had no idea that the hysteresis of ice extent relative to temperature was that great! Learn something new every day. I appreciate your blog. OK, Im sure it is out there somewhere, but can someone point me at an example of the ice graph at the beginning of this thread with an indication of what 1 standard deviation would look like? Thanks in advance…. different dataset, but, it has area and extent with 1sd shown. Jeff, we all know the Arctic Sea Ice extent is related to atmospheric circulation patterns and has nothing to do with CO2 concentration. Therefore it is important to appreciate the situation in Europe for the past weeks: a similar setting to what happened in 2007 was covering this area. Eastern Europe was covered by a powerful AA creating a heat dome -Bulgaria had a heatwave- while all MPHs from Greenland origin were affecting western Europe and dislocating on the AA over Germany resulting in poor weather in most western Europe. The result was pushing vigorously the warm air advection towards Scandinavia and then toward the Arctic. This dynamical situation focused warm air advection and the resulting pattern led to an acceleration of sea ice melt. This week, satellite images show a slight change, as the AA now englobes western Europe (Scandinavian MPHs) and Greenland origin MPHs dislocate at the level of the British Isles -hence the UK Met correction about a less than stellar summer in the UK-. Consequently the melting rate deccelerated. Should the present type of conditions maintain themselves, we may see a stabilization of the melt and might simply not repeat the record lows. #16, If everybody knows then I guess I’m the slow guy on the block. I think the video is a more clear demonstration of what exactly happened in 07 as compared to a written interpretation of weather patterns. I don’t believe the melt had to do with a heat wave but rather a flow of heat so perhaps we agree. Currently the situation looks quite different to me from 07. At this point the centroid of the ice mass is centered on the continent because there has not been the same flow from the south west. It is weather though and it can change. Any visual demonstration that wind and water supersede radiative heating is great in my book. Keep up the work, Jeff. I could do it but it goes all the way to the 27th of last month. I will do it probably in a week or two either way depending on what I’m interested in. Is there something in particular you’re looking for? Nice work. First time visitor here. I’ve seen your work before over at WUWT. I’ve worked as computer programmer for a few decades, so I understand that no matter how hard you work on something, no matter how bleeding edge you are, some jerk will always ask for something more out of you. So, I’m going to be that jerk for you . I like the ice vids,I do. The problem I have is that it could use a clearer impact. I do get a fair sense of what’s going on, but it’s tough to keep track of ‘when’ you are as the video tracks along. For ‘desert’ after viewing the vid, what I’d love to see is a single large arctic jpg on which you superimpose the track of the arrow’s point for the last number of years. 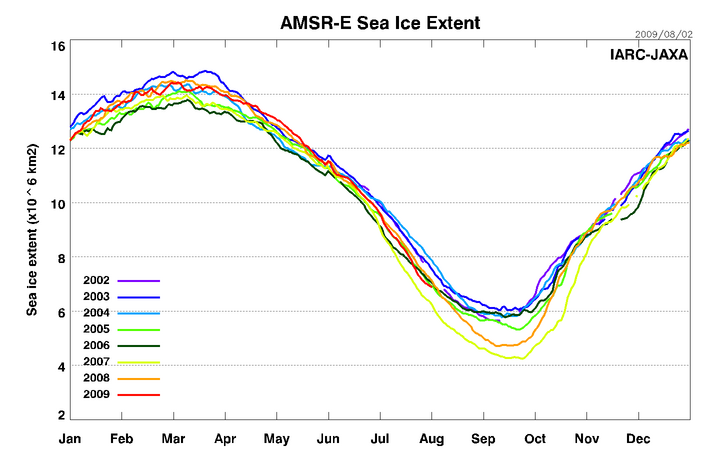 If you color match each year’s trail with the Sea Ice Extent chart that would be good. Without seeing how that picture shapes up, I don’t have a good suggestion as to how dates points within a year might be indicated, other than perhaps a black mark at each year’s sea ice minimum. I was thinking that the image should be full screen sized despite being chunky grainy so that thin tracks for each year can be differentiated from one another. From watching the quivering arrow in your vid, you might need to smooth the data into a few day running average location rather than just the daily datum. If this is doable, I’d hope that anomalous years might jump out more clearly.